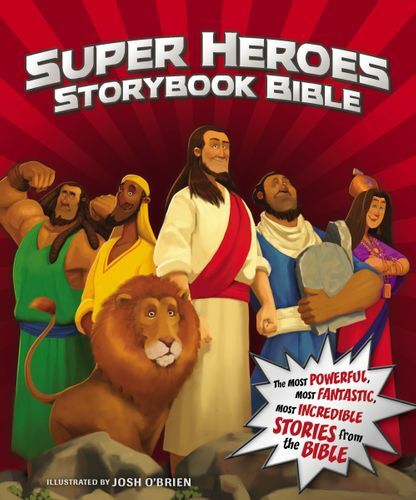 The Super Heroes Storybook Bible is an action-packed Bible for children filled with eye-catching illustrations by Josh O’Brien and text based on the New International Reader’s Version (NIrV). Children will be able to read more than forty stories about important and courageous characters of the Bible, such as Noah, Miriam, Moses, Jesus, Mary, and many more, demonstrating the rewards of becoming heroes for God. In addition to inspiring NIrV Bible stories, this storybook Bible will also include call-outs that encourage readers to cultivate important traits like bravery, honesty, and kindness in order to become one of God’s super heroes in their own life. The cover of this book is printed on metallic paper and shimmer and shines with heroic detail.